Michael Jackson's death continues to form effortless metaphors for his life. 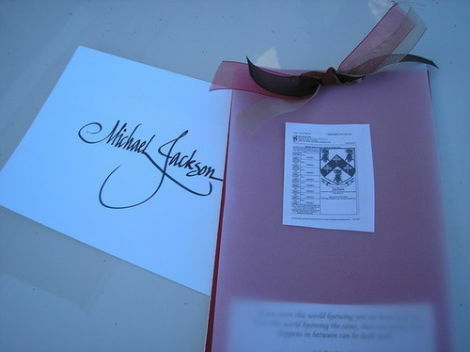 At his private family funeral the remaining Jacksons were charged $35,000 for 'burial garments', $21,455 for food and $3682 for a framed picture, among other ludicrous inflations. 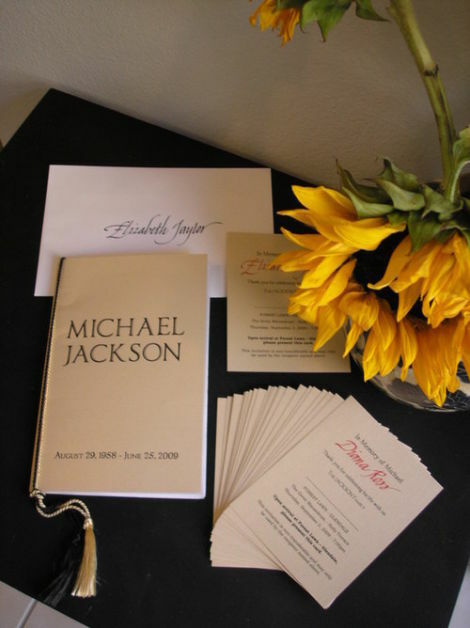 The Associated Press reports that the funeral cost $1m in total and the family were also charged $1,975 for wardrobe, $2,000 for usher costumes, "$959 for embroidery; $11,716 for invitations and programs; $16,000 for flowers; $30,000 for cars and security; and $15,000 for a funeral designer." My experience in defining and executing the mood of your special day is my area of expertise. Because of my unique personalized service, you will have the experience you have always dreamed about. In short, I can connect with your desires & satisfy your budget at the same time. She's definitely good at writing fancy, but define 'satisfy your budget'. I know nothing about the world of high-end calligraphy so I've emailed to ask whether this is a typical price for pieces of paper with nice handwriting on them.